In its reportage on climate change research at ExxonMobil, the Los Angeles Times made a very telling editorial decision. 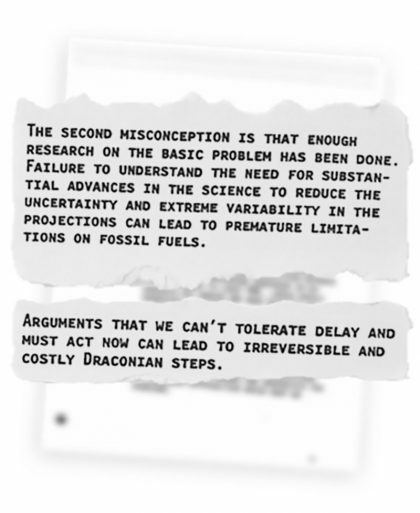 The paper chose not to publish the document it cites as Exhibit A in its case against us: a 1989 presentation to Exxon’s board of directors by senior company scientist Duane Levine. I have no doubt why the newspaper doesn’t want the public to see this document. 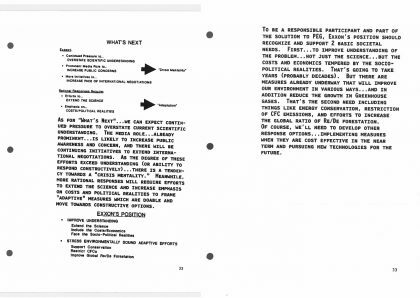 When you read it – which you can do here – it soon becomes clear that the document undercuts the paper’s claims that ExxonMobil knew with certainty everything there is to know about global warming back in the 1980s yet failed to sound alarms. By deliberately hiding this report from readers (while simultaneously citing it to make damaging claims about our corporation’s history of scientific research), the Los Angeles Times undermines the already low levels of trust in the media and in the media’s ability to cover issues of science and policy with accuracy and fairness. Case closed, or so the Times would have you think. In fact, here’s the screenshot from the actual report, which also includes Levine’s conclusion that to be a “responsible participant and part of the solution” to the climate change challenge, the company should continue research, support energy efficiency, reduce emissions, and pursue new technologies. Is it any wonder the L.A. Times chose not to disclose this document to its readers? Or that the paper continues to fail to make the presentation available on its website? Doing so would reveal its investigative work is not only unsupported by the supposed evidence, but is actually completely undermined by their “prize document” in a way that casts serious doubt on the ethics and agendas of its reporters. Levine’s presentation from 25 years ago makes clear we wanted to pursue – and support – greater scientific understanding, which we have done and continue to do. 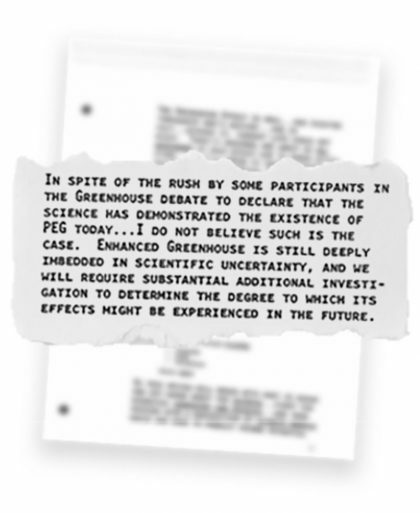 Does the Levine document prove, as some claim, that our corporation was convinced beyond all doubt a quarter century ago that global climate change would happen and what the effects would be? Hardly. Even in 2015, the leading international scientific authority on climate change – the U.N.’s Intergovernmental Panel on Climate Change – acknowledges wide gaps in climate science exist that further research must address. Without producing the Levine document for readers to judge for themselves, the Times felt it could make whatever claims it wants, while expecting readers to rely on the reporters’ interpretations for accuracy. Of course, this is not 1989, when media consumers only had a few options, a few city papers dominated, and there was no Internet. In 2015, we know from cases like this that blind trust in those claiming to have the truth is unwarranted. For those interested in finding real solutions to the risks of climate change – whether you are an elected leader, a policymaker, or concerned member of the public – it starts with doing your own due diligence. The whole business is, in any event, utterly ludicrous. If Exxon knew all about the science 26 years ago, why didn’t anybody else? Why did they even bother to set up the IPCC in the first place, or spend tens of billions on climate research since, if Exxon already had all the answers? And, if it really was such common knowledge, why is not the Federal Government in the dock for doing nothing about it? Thanks, Paul, the LA Times proved itself, once again, to be a propaganda rag. What I just do not understand is how significant parts of the main stream media can keep lying about climate change and get away with it? Why are Exxon not suing? Ambrose lEvans- Pritchard’s article in the Telegraph today is entitled “ExxonMobil on the rack over climate claims” repeats and elaborates on the case saying that New York prosecutors have subpoenaed Exxon documents implying their guilt. He has “previous” for dodgy articles on the lines of Mark Carney. Another Telegraph gem on 29 October “Sun setting on fossil fuels as China and India flaunt their green credentials” He has absolutely no regard for any evidence to support his arguments, but still gets away with huge credibility in the business pages. Alarmists have not succeeded to convince the public to support their agenda, witness the US legislature in the hands of skeptics. So the alternative is to convince the judges, who are far fewer in number, but with the power to make it happen. The plan to catch Exxon in a tobacco-style litigation was hatched long ago, but timed for impact ahead of Paris COP. We are left to hope that the legal system is able to apply rationality based upon legal precedents. If they didn’t know, is it reasonable to expect scientists working for a mere oil company to know? Wow can LA Times counter that ? Entire problem can be easily solved by Exxon shutting down on their own for a period of one month. Ensuing chaos and economic collapses are enough shut up the main stream media for good. It will also show the goal is NOT to shut down Exxon, but rather to tax it just like cigarette companies. There is no goal to “save the planet”, only to “enhance the revenue stream”. If none of the oil companies has what it takes to do this, the slow bleeding to death of society by the greens will continue until society collapses. My bet is Exxon and all others will continue to allow the blood letting, hoping the current owners are long dead before the collapse occurs. Selfishness is the name of the game on all sides—pretend nothing is wrong and hope for the best by Exxon and continued blood-letting and parasitic attacks by the greens. No one in any of this actually cares beyond their own life span. Yes I did wondered if the demonising of Exxon had been thought through to its logical conclusion. Exxon is shutdown/bankrupted and the problems that will cause. Joe: you should also be aware that the Summary for Policymakers being a political instrument,had the wording changed to say exactly the opposite. Any doubts or uncertainties within the science are rarely reflected in the Summary, and obviously the science, if unwelcome to the politicians, is changed to instead reinforce the big Green lie. Hence my quote from, and link to, the actual document. MSM has been bought and in control of the Progressives for years now.They won’t report on anything contrary to the AGW narrative and continue to support it with questionable information/propaganda. The LA Times went on record years ago that they would no longer print any letters to the editor that questioned AGW. Freedom of the press works both ways? It would appear that Exxon has a cause of action against both the LAT and InsideClimateNews based on the way both have misrepresented the Exxon materials. Nice introductory lecture for the Exxon board by this guy Levine. 25 years later we wouldn’t need to change much of it. Wonder where he is now? And what he’d say about the state of science today? Exactly. The 1989 Exxon report is very prophetic about the “Players” (P. 23-26) and “What’s Next” (P. 32). Exxon have brought many of their problems on themselves by sucking up to the greens when they should have had the confidence to stand up for the truth. They produce natural gas. Strategically, it became apparent with fracking that gas could push over ‘King Coal’ in North America for electricity generation via ever improving CCGT. Coincidentally, that fracking reality roughly coincided with AR4. So guess who changed positions? Now guess why. That said, the NYAG is on an et al inspired fishing expedition and will likely come up with nothing. Exxon contributed to the greens, and also coauthored many published papers in the area. They invested in biofuels. The AG will have to show Exxon had knowledge ‘hidden’ from shareholders. Very unlikely. This is just more dirty politics. Literally, I eat due to my stock in Exxon-Mobil. The LA Times surely knows the “settled science” is basically an empty box and is blowing smoke, like all the other climate fanatics, to try and hide this. True—”they” know the truth but hope to keep “you” from finding out. It’s a complete dictatorship on the level of North Korea when it comes to global warming. No one can know the truth except the leaders. “…….Why won’t the climate lobby rally behind fracking and natural gas as a planet saver? What’s clear is that Asia’s priority right now is growth — and rightfully so. Nations there hope to soon move nearly 1 billion more of their citizens into a Western middle-class living standard. That requires cheap energy, not expensive and unreliable green energy. When the Paris meetings end, expect happy talk from the leaders of the world that nations have made iron-clad commitments to move away from fossil fuels. Alas, the only person on the planet who’s still naive enough to believe the fantasy is Barack Obama. You assume he believes the fantasy. Exxon’s lawyer will have fun with this. I look forward to the LA Times being bankrupted. A front page grovelling apology and retraction would be more fun.